Light, healthy and packed with protein, these lemon chicken skewers are quick to make and fantastic for barbecues and quick dinners! In a ziplock bag or a small container, add the chicken strips and the rest of the ingredients. Close the bag and massage the meat with your hands to cover entirely with the marinade. Refrigerate for 10 mins. Thread 1 chicken strip on each skewer towards end of the stick. Alternate chicken with lemon slices until each skewer is full. Heat a large grilling pan over medium-high heat. Cook the chicken skewers for about 6 min on each side, or until golden and no longer pink inside. For the yogurt dip: simply mix the ingredients together and season with salt and freshly cracked black pepper to taste. 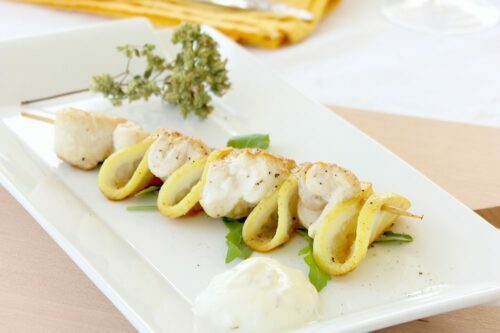 Serve alongside the lemon chicken skewers and a salad, for a healthy and balanced meal. Enjoy!